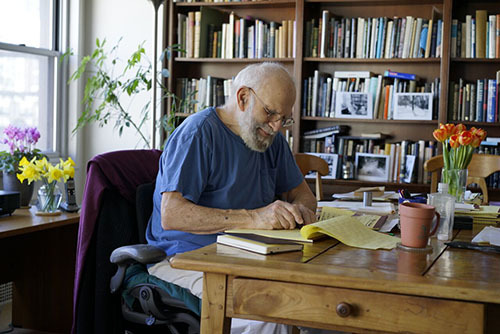 We are proud to announce the upcoming publication of a new book by Dr. Sacks: titled Gratitude, it brings together in one volume four gemlike essays written over the last two years of his life and first read by millions worldwide in The New York Times. It begins with Dr. Sacks’s essay on turning 80, originally titled “The Joy of Old Age.” In it, he writes that embracing old age has brought “not a shrinking but an enlargement of mental life and perspective.” Rarely has an essay struck a nerve as this piece did; it was the #1 most e-mailed article in the Times for an entire month. In January of 2015, only a few weeks after he completed the manuscript of his new memoir, On the Move, Dr. Sacks received the news that a rare, uveal form of melanoma had metastasized to his liver. Within days of the diagnosis, he began writing “My Own Life,” in which he expressed an overwhelming feeling of gratitude. “Above all,” he wrote, “I have been a sentient being, a thinking animal, on this beautiful planet, and that in itself has been an enormous privilege and adventure.” This essay, too, went viral. In July, he published “My Periodic Table,” in which he spoke of the sense of awe and eternity inspired by an expansive night sky filled with stars, and about his deep love for science and nature, for metals and elements (“little emblems of eternity”), and for lemurs. Together, these four extraordinary essays form an ode to the uniqueness of each human being and to gratitude for the gift of life. Gratitude will be published worldwide, in hardcover, e-book, and audiobook formats, beginning November 24. It is available for preorder now from your local bookseller or online bookstore.